and the recipe will work with wheat based products too. It made enough for four huge portions or six medium. Method: fry the vegetables in the oil for a few minutes until softened. Add the passata, rinse out the pack/bottle with the water before adding it to the sauce. Bring to the boil, add your herbs and salt. In a flat oven proof dish layer up the lasagne and the tomato sauce. It’s best to put a little sauce on the bottom to prevent sticking. The Lidl brand of lasagne did not need pre soaking (thank goodness! It always sticks together!) but check the instructions on your pack. Make the top layer sauce too. Method: melt the margarine and stir in the flour. Gradually add the milk over a medium heat, stirring all the time to avoid lumps (though don’t worry too much, in this dish they’re not very noticeable), until the sauce thickens. Add your seasoning and pour onto the top of the lasagne. Bake in a pre-heated oven at 200C for at least forty minutes or until a knife slides easily into the middle of the lasagne. 1. This recipe used the most basic of vegetables, you can use whatever you have to hand: peppers, courgettes, peas, sweetcorn. We added sweetcorn to the white sauce pictured. 2. A layer of tinned spinach instead of the last layer of tomato sauce is very nice and juicy. Ditto mushrooms. 3. We topped with a small packet of sunflower and pumpkin seeds. 4. You can add tomato puree if the sauce seems overly runny, though remember it does need to have more liquid than plain pasta sauce as the lasagne will absorb some of it. 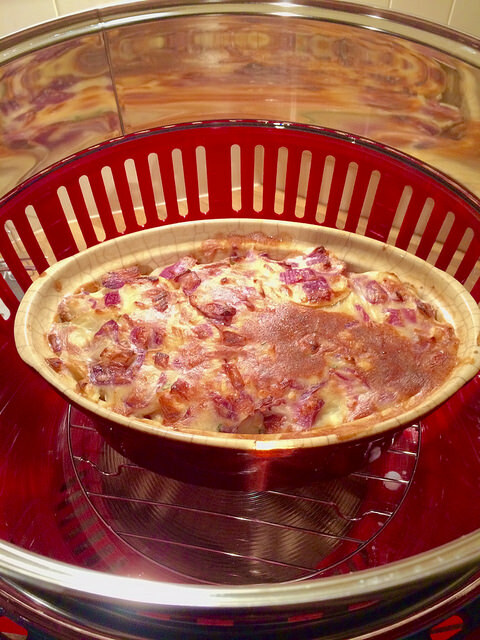 A protein dense and filling meal, the recipe is a variant of red dragon pie. I bought the dried beans very cheaply from Approved Food, they do seem to get them in quite often. Mention goes to Lucy who reminded me of the protein rich properties of Amaranth, and then I was surprised to see it at only 83p for 250g from Goodness Direct (at time of writing). The quantities listed are for an enormous pie that feeds four people with lots of leftovers for the next day. Adjust as required. a bag of potatoes (I used 750g), peeled if needed and chopped. The smaller you cut them, the less cooking time they require. Place your soaked beans in a large pan, cover well with water, bring to the boil and turn down to simmer. Different brands seem to need different times of cooking. Supermarket ones could need an hour, organic types need less. Once they are beginning to soften, add your amaranth, vegetables, herbs and bayleaves and cook until tender. The amaranth will swell quite a bit so top up with water if needed. Once it’s all cooked add the soy sauce, tomato puree and season to taste. It’s a good idea to put your potatoes on to cook at the same time as the amaranth, or before, for simultaneous readiness. Mash the tatties up with marge, milk and seasoning and place on top of the bean mix. It’s great if you have hob to oven cookware and can plop everything in the same pan, but if not layer them up in a suitable casserole. Run a fork round the top of the mash for a nice finish. Bake in a hot oven for 10-20 minutes until nicely browned. The leftovers are often comprised of mainly bean mix, so get used as a base for pasta sauce the next day. Gluten-free if you’re careful with your brand of soy sauce, some have wheat. A truly versatile and cheap dish this as the filling can be more or less anything you want. Weve done basic vegetables here but leftovers can make a spectacular pasty to rival expensive ready made ones (chilli, curry, bean casserole). Making your own pastry is also very thrifty – at the time of writing value brands of flour come in at 43p for 1.5 kilos making the flour in this recipe cost just under 10p. If using margarine at £1 for 500g that’s your block of pastry for 40p all ready to make 4 substantial pasties (or one big pie). 300g of flour (any type you like really, self raising will puff up a little, plain won’t – we used wholemeal in these pics, white would be lighter in colour). other additions that spring to mind: frozen peas, red kidney beans, other root veg. To make the pastry: place flour in a bowl. Break the marg into small pieces and rub it in to the flour until it resembles breadcrumbs. Add a very small amount of water and knead this into flour until you have firm dough (adding more water if too dry or more flour if too wet). Sprinkle flour on your working surface, divide the dough into four equal pieces and roll each one out to a rough oblong shape. To prepare the filling: add oil to pan and heat then add in the vegetables and salt and mix well. Add other ingredients if using, stirring thoroughly to combine and prevent sticking. Cook for a few minutes. Share the filling out onto the pastry oblongs, placing it on the front half of each, then fold it over and squeeze the edges together to seal (you can use some water for this if a bit dry and not sticking well). Onto a baking tray and into the oven at 200C/400F for 20 minutes to half an hour until pastry is well browned. Nice served with oven chips (50p a kilo in Lidl at time of writing) and salad or great in a packed lunch. Melt the margarine (in a large pan for mixing) and cook the celery and onion in it for a few minutes. Mix the yeast extract into the hot water (alternatively you could use any stock you like) and add this to the onion and celery. Stir in the flour, nuts, herbs, breadcrumbs and salt and pepper and mix well. Allow to cool slightly while you grease a loaf tin. Place the nut roast mixture in the tin and press down well. Bake in the oven for about 40 minutes at 180/360 then turn out of the tin and slice. Nice served with all the traditional trimmings. Variations:- you can substitute wine (red or white) or soya milk for the water and yeast extract. A layer of sliced mushrooms and garlic is nice. Fill with sage and onion stuffing. You can use this mixture to stuff vegetables like peppers or large tomatoes for a different dish too. The rosemary and redcurrant jelly detailed here is a gorgeous accompaniment to any nut roast. Amazing in sandwiches too with the cold sliced roast next day. If reading this in winter, sorry, it’s a bit late to go out and get redcurrants (though rosemary plants grow all year round! ), but it’s a great one to make for next year. A jar of that would be a very nice gift too. From Jane of Vegetarian & Vegan Foundation and Viva! 1. Saute onion and garlic in the tsp of oil until soft. (If adding chopped mushrooms or other finely chopped veggies, cook in at this stage too). If a little dry, just add a splash of water/stock. 2. Add grated carrot and spices and fry for a minute or two. 3. Mash up cooked beans/lentils with a potato masher and add them to onion/carrot mix. 4. Add tomato puree, mustard and soya sauce and mix in well. 5. Add oats and stir in well also. 6. Best made a few hours (or even night before) then stored in fridge, but they’ll still fry up if you make them straightaway. 7. Form the mixture into burgers (lovely and messy!) and fry gently on each side with the 1-cal spray or oil until they are browned. 8. Good on their own or in a wholemeal bun with vegan mayo or relish, plus salad and all the trimmings. Also nice with baked potatoes, potato wedges, brown rice salad… just about anything. Try using a burger press with this recipe, for perfectly round burgers! Cook the noodles according to the instructions on the packet leaving out the flavouring sachet which is usually very chemical based (if you don’t mind that it is a very cheap way of making soup for another time). Cook the onions and garlic in the sunflower oil for a few minutes and then add the chilli and stir in well. Add your vegetables and soy sauce and cook for a few moments until slightly softened and then add the soya or tofu and stir fry for another 10 minutes or so before adding the rice noodles and combining well (you may want to cut them up if they are very long). At the last minute sprinkle the sesame oil over the dish and serve at once. This goes very well with a fresh salad of lettuce and herbs. Extremely simple and cheap – even if you’ve never cooked before you should manage this one! Part-boil the potatoes for 5 or 6 minutes until starting to soften. Thinly slice them. In a large casserole or lasagne dish place a layer of potatoes then a layer of beans, then onion and repeat until all used up. That is the basic dish but you can add any other layers you like (experiment! Any tins lurking in the cupboard? ), such as the garlic mushrooms, sweetcorn, spinach or rice ones above, making the last layer potatoes. Spread the sliced tomatoes over the top, dot with the marg. and sprinkle on the sesame seeds. Bake for about an hour or until the potatoes are soft at 190C/380F. Pictured Bake cooking in an energy saving Halogen Oven. Fry the onion, garlic and apple in the olive oil for a few minutes. Add the curry powder and stir for a minute or two. Add the tomatoes (chop them if needed) and green pepper. If you like really sweet tasting curry, then add the raisins and coconut. Cook for about 15 minutes at simmering level and then add your chick peas and cook for a further 10 minutes. Shortly before the end of cooking time put some frozen peas in, as these will go mushy if overcooked. Add salt to taste. We like this best with white basmati rice (you should get a whole kilo for unde £1 in the cheap supermarkets or value ranges) and lots of little toppings. Ideas for toppings are chopped fresh tomato, cucumber, sliced banana (yes this does work! ), sunflower seeds, avocado (not the most frugal ingredient but jam packed with nutrients), in fact anything you fancy! My kids love these all put in small separate bowls so they can help themselves. A very frugal variation of this is to make potato and pea curry by replacing the chick peas with value tinned potatoes. Beans are the ultimate frugal food. High in protein and vitamins and versatile in use. You can either use two tins of bought beans (less frugal but still cheap) or soak dried ones overnight and then boil until cooked (can be over an hour for some beans) – good ones for this recipe: chick peas, aduki beans, black eye beans, green lentils, kidney beans (usually 11p for a value tin), borlotti and lima but any will do. Check out bulk prices with companies such as Goodness Direct and co-operatives. Clearance food specialists Approved Food sometimes have some bean bargains too. Fry the leeks in the oil for a few moments then add the beans and stir until coated with the oil. Add the tomatoes, water/stock, salt and herbs and bring to the boil. Simmer gently for about 20 minutes until cooked – alternatively place in oven to cook – a good idea if you are already using it for baked potatoes or herb bread which go very well with this dish. Maybe you could fit a cake in there too? Sorry – off on a frugal tangent! Variations are many with casseroles – they are great for using things up: Add the dumplings from our mince and dumplings recipe. Add any vegetables that need using up – tinned potatoes mixed through could make this a one pot meal. Add rehydrated soya chunks or chopped sausages Make it fruity with dried apricots. 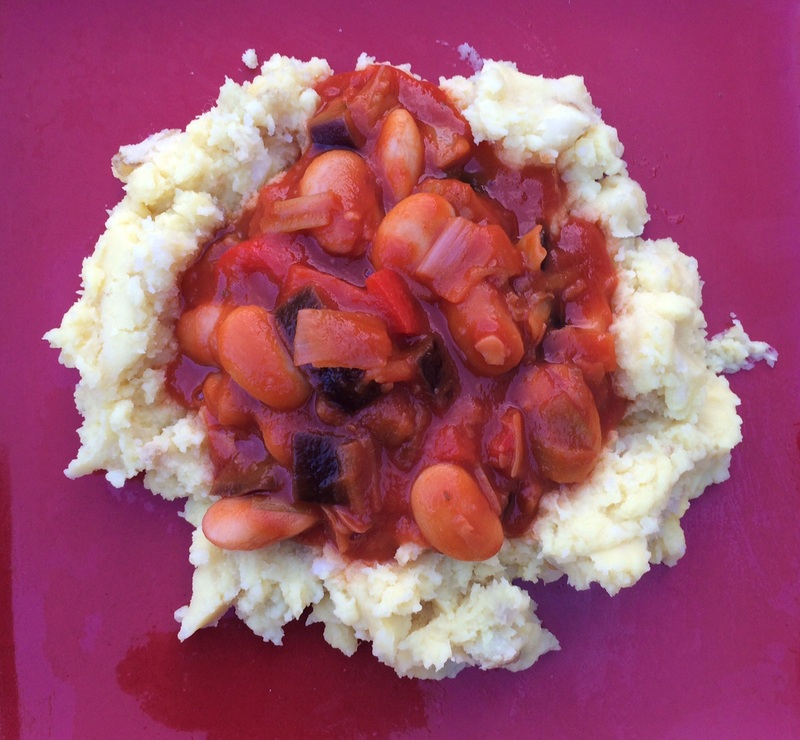 Pictured is a casserole made with tinned butter beans, aubergines and leeks served with mustard mash.